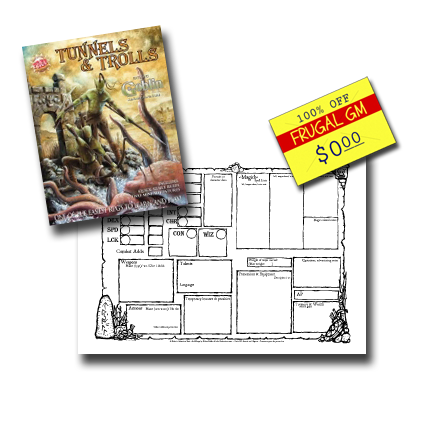 Today I decided I'd check out Tunnels & Trolls, pretty much for the 1st time. I do have a copy of the 1st printing from the old Kickstarter, but I went ahead and downloaded the free rules-sampler from DriveThruRPG. The rules are a bit sparse, but enough to roll up my new, extremely un-charismatic Dwarf, Mög the Defiler. Mög has a Charisma of 4, so stealing a name from the Uruk-hai in Shadows of Mordor seemed fitting. Of course I need a PC sheet, which wasn't provided, and by complete happenstance the one I found I wanted to use was from my internet buddy Billiam Babble over at Inked Adventures. I was probably so engrossed in rolling up a PC that I didn't even realize I was on his blog until I went to source the PC Sheet. Go figure. Of course rolling up a PC wasn't nearly as necessary as I thought since the free solo adventure has you starting out as a Goblin. Wouldn't you know my poor Gobbo died during his first contact with another living being...and then again, and again, and again. OK, he only died twice before I decided to quit. They were both quite stupid deaths that could have been avoided had I even a small sliver of self-preservation in mind. There really isn't a lot to the rules and what was there was a bit confusing for a while, but it mostly comes together enough to give you an inkling of what the full rules might be like. These rules let you create a Warrior or a Wizard and there are four race options. It's enough to get you to see if you want to pick up more.....which is kind of the point.